At least 21 people were killed and over 90 injured, 26 of them grievously, in the derailment, the railways said. At least 22 people were killed in the train derailment. 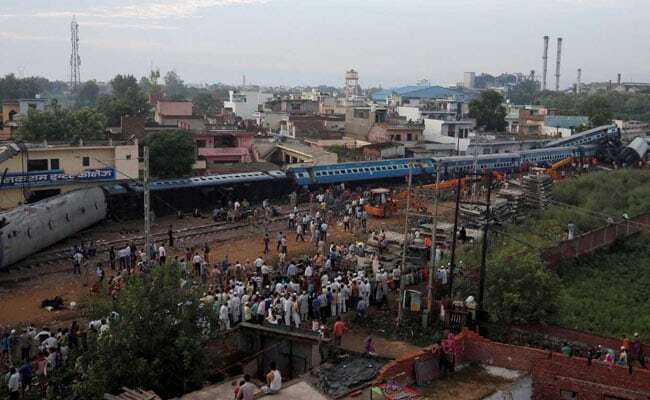 At least 20 people have been killed and over 200 injured in Saturday's train tragedy in Uttar Pradesh' Muzaffarnagar. Among the dead was Alok Sarkar, a 48-year-old railway employee working with Divisional Railway Manager (DRM) Office in Delhi. The Puri-Haridwar Utkal Express was always the preferred choice for Mr Sarkar. On Saturday, he had boarded the ill-fated train for Muzaffarnagar - the journey turned out to be his last. "He always used to take this train," he added. Mr Sarkar body was taken to Delhi for cremation today. Thirteen coaches of the train went off the tracks around 5:45 pm in Khatauli, about 100 kms from the national capital, New Delhi. One of the coaches crashed into a house by the tracks. At least 22 people were killed and over 200 injured in the derailment. "We have identified about 12 bodies and their post-mortem have been conducted," said Saharanpur Divisional Commissioner Deepak Agarwal. Railways Minister Suresh Prabhu has ordered an inquiry into the incident. Four people were suspended, three others sent on leave and one official was transferred based on an early probe, a railways spokesperson said on Sunday.